Brendan recently reviewed the ebook It Couldn't Just Happen by Lawrence O. Richards. Kids are daily exposed to the theory of evolution by the media and public schools. It's not safe to assume that your kids will reject that theory. It's up to us as parents and Christian leaders to make sure our children know the truth about the creation of the world. With thousands of evidences to prove He created and sustains the universe, It Couldn't Just Happen will fascinate kids with fun activities and examples of God's marvelous works. 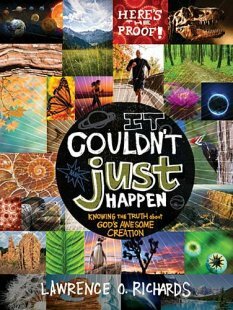 It Couldn't Just Happen is a little book packed with lots of information proving Creation of the Bible over the theory of evolution. Richards starts with the Creation event itself and follows with amazing facts about the human body, animal and plant life, fossil records, weather events, and nature's impossible-to-ignore reflection of its Creator. Throughout, he uses Scripture proofs and without hesitation says the Bible is the inspired, inerrant Word of God, and that there is no room for doubting its validity when it comes to Creation, historical Adam and Eve, and the proof of God's handiwork in humans and nature. While the book is marketed as a children's book, I believe it's better suited for 6th grade and above. It could easily be used in a home school setting, with easy-to-read sections, colorful photos, and follow-up activities at the end of each chapter. I liked the writing style and think it would make a nice supplement to a science program. I enjoyed reading it and look forward to using this resource in the future with my daughter. I received this book free from booksneeze.com Where bloggers get free books in exchange for their reviews.